Happy Valentine’s Day, friends! The one day out of the year when romantic relationships are put front and center. For some, it is a special day of basking in the love of your boyfriend/fiance/husband. For others, it brings sadness, envy, loneliness, pain or dozens of other emotions if you’re currently in a not-so-good relationship or single. We put marriage on such a high pedestal that to many it becomes an idol that defines womanhood. As if a woman only has worth if she is in a romantic relationship or if she is a wife and mother. In many religious communities, especially, women are often told they have one calling and purpose in life: to get married and raise children. If you're raised with that kind of teaching, it shapes who you are. It puts you on one path and no matter what happens, if you deviate from that path and the accompanying timetable, you end up feeling like a failure - like you're not enough for people or for God. You strive so hard to achieve that wife status that it often comes at the expense of your spiritual growth. But, it’s not just religion. Social media, television, movies, books and society in general is a constant stream of images of happy couples and the search of love. Friend, God gave Adam an assignment before He gave him a wife. Too many of us are seeking the person before we seek our purpose, before we seek Jesus, and before we ask Him what He wants from this one life we've been given. I've seen too many girls groomed to become brides, wives, and mothers (all good things to know! ), but in the meantime, disregarding a more important education: preparing to become a Bride to the Bridegroom one day and preparing His bride for that day. Because so often, we are taught that as long as you dressed modestly, showed up to church each week, kept yourself chaste and got married by 22, then you've made it. Ministry and work was left to the men, while being pretty and learning how to cook to the women. Meanwhile, the world - and even many Christians today - tell us to date around and put all of our effort into finding a spouse. So, you jump from relationship to relationship, hoping maybe this guy will be the one that will finally make you a Mrs. and your life will become everything you dreamed of as a little girl. But long before you are a wife or mother, you are a daughter of God with a very clear call to go out and make disciples and to make His name known to the ends of the earth. In His eyes, there is not male or female, but we are all one in Christ (Galatians 3:28). Although God put a different hierarchy in the covenant of marriage, when you step outside of that one aspect of your life on earth and look at the bigger picture, we are all equal heirs of God's grace of life (1 Peter 3:7). Marriage has its place and God created a role for each gender within a marriage, but before you are your husband’s beloved, you are God's beloved, forever and always. You don't lose your identity as God's beloved daughter when you marry, but instead you add another layer to who you are, which is based on your identity first and foremost as the One He redeemed for Himself at a great cost (we’re talking more about the topic of identity in our Q1 Small Group - join here!). Catch the replay of our winter 2019 study on what the Scriptures have to say about who God is, who we are in Him as a new creation, and what our purpose is on this earth. Seek God first. Before you seek a husband, a career or a ministry, seek Him first. And if you’re in a relationship or married already, this is as much for you as well. Because your husband and children are your greatest ministry, but above them even, you still have a greater calling to go out and make His name known. Yes, your disciple making is probably happening at home right now with those kiddos God entrusted you with, but don’t let that become the identity box you belong to. Remember, all the things of this world are temporary and we were made for eternity. 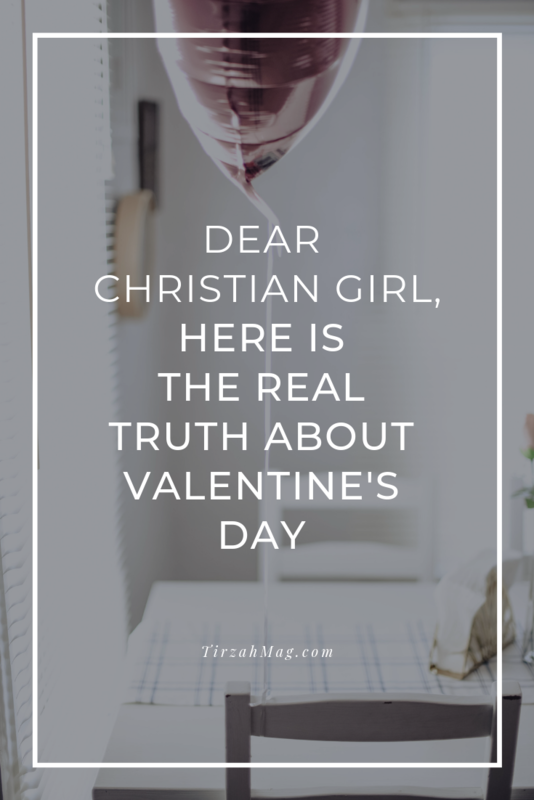 Just like Valentine’s Day, that comes around once a year - husbands, children, heartbreak - all of that will come and go from our lives, but we are called for the building of the Kingdom of God, which lasts longer than any holiday, marriage, or anything in this world. You are more than a (someday) girlfriend, fiance or wife. You are HIS. Yelena is the founder and editor in chief Tirzah. Yelena works as an attorney in international tax consulting and in her spare time, she is working on her first book for unmarried twenty-something women in extended waiting seasons and running Tirzah. She has a passion for pointing young women to Christ, and enjoys reading, writing, traveling, and spending time with her family. This article is an excerpt from Yelena’s upcoming book for the twenty-something unmarried woman in an extended single season. If you want to stay up to date on the publishing process and be the first to know the release date, sign up below for updates! Thank you! Look for more details in your inbox in 2019 and 2020!